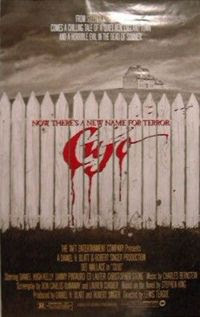 This last week we watched the movie Cujo on DVD. Always an interesting film to watch considering that I used to have a Heinz-57 dog named Cujo (my oldest sister said that when she went to pick him up, he ran after her while she was still in her car). Movie scared me when I was a kid. As an adult, it’s a different story. I wonder if a rabid dog can really still be able to rage about even after a) having been hit hard several times in the head with a baseball bat and b) having been stabbed with the not-so-short stub of a baseball bat. Maybe the dog’s demon possessed, I don’t know. But then, it is based on a Stephen King novel. * A quick check of some online references reveal that, no surprise, the movie is very much different from the novel. 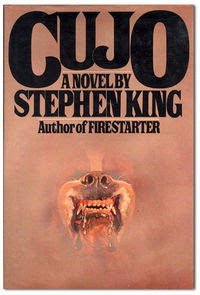 For instance, the novel implies that the dog is indeed possessed by some unnatural spirit. Some portions of the book even are told from the dog’s perspective. Cujo is doing these things and has a hard time understanding why he is. It really makes me think the movie should be remade someday since the original gives the bland impression of a dog with garden-variety rabies doing these things. A dog with a supernatural kick would indeed be far more terrifying and would explain the a and b I listed above. If I ever do read it the novel, I’ll probably tread light. I remember once that my sixth-grade homeroom teacher, Mrs. Saenz said that she read through it and was repelled by some of the book. The movie has a few brief scenes that deal with Donna Trenton’s infidelity, whereas the book gets far more graphic. I do remember from the movie that the character of Tad Trenton (played in the movie by Who’s the Boss? co-star Danny Pintauro) died in the book but miraculously lives in the movie. Hollywood does seem to love the sappy, happy ending. Turned down what I had hoped would be a good writing assignment. The impression I got over the phone was that the pay would be based on how well the articles were written. I then learn that they wanted 2-4 articles weekly. In return, I would receive a byline for the articles written and “good exposure”. When I asked about pay rates, I was told they didn’t pay for the articles. Well, I’ve been a professional writer for almost eight years. If I write for you, I expect to be paid. Period. My only exceptions now are inspirational writing, and even then it’s pretty much confined to the My Two Shekels column that I write. Exposure and bylines are nice, but I expect to be paid. Sounds like another company wanting skilled writing work done but yet not wanting to pay to have it done. Can you imagine needing the transmission in your car replaced and telling the mechanic, “I won’t pay you, but I’ll tell all my friends how good a job you did”? The mechanic, naturally, will tell you to take your business elsewhere. Exposure is nice, but here’s what a friend (a successful journalist) has told me: if a well-known, reputable company wants you to write for them, they will pay you. My wife, Jennifer and three sons each made me a birthday card! It was very nice of them. One card made fun of my age (which I thought was hilarious) and two other cards had the Dallas Cowboys logo on front and ducks on the front. Jenn also gave me a $10 gift card for Barnes and Noble. 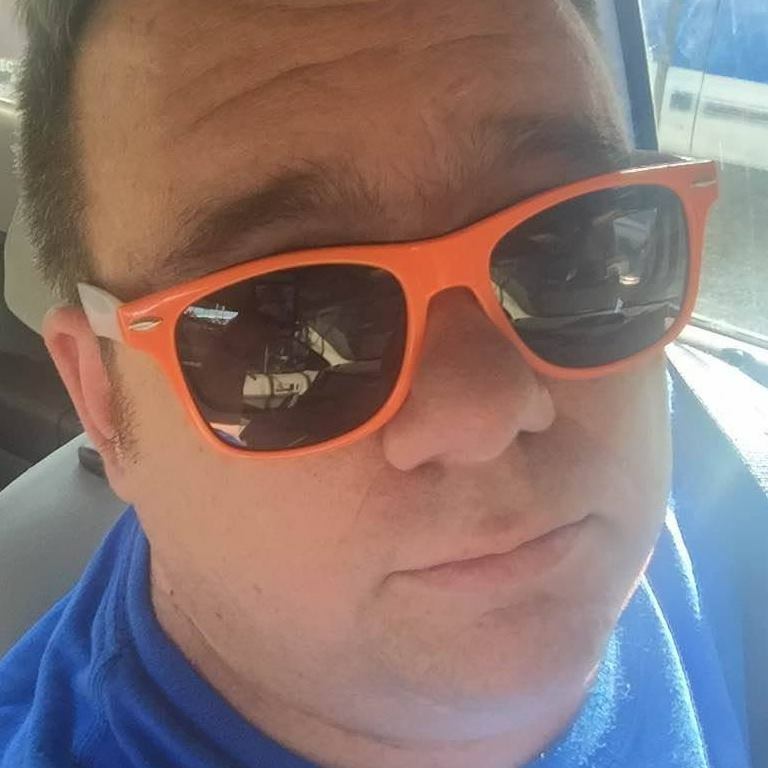 Wow, hard to believe I’m 35 (or, as I prefer to call it, the sixth anniversary of my 29th birthday). Lots and lots of snow up here today. Skidded into a ditch this morning. Roads are really bad. It’s been a while since I’ve seen a really great sci-fi film. Event Horizon wasn’t too bad. Independence Day was absolutely horrible and predictable. The Terminator was pretty good, and two of my favorite sci-fi flicks were both made by the incomparable Ridley Scott: Alien and Blade Runner. 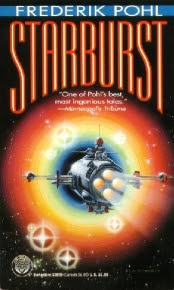 Years ago, I read this Frederick Pohl novel called Starburst. It’s about a dying earth where they are desperate for new technology to keep the planet and the human species going. So, they recruit eight people—all brilliant in the areas of science and mathematics—and send them on a 20-year round-trip mission to our closest galactic neighbor, the star Alpha Centauri. This star is about 4.3 light years away from us and, in the book, it has a planet (called Alpha-Aleph) orbiting it. Their mission: to see if this planet is hospitable for human life and to spend the voyage there trying to make new discoveries in math and science that will benefit earth. But as they get closer, they realize something horrible: there is no planet. The photos showing Alpha-Aleph were doctored. They were sent out in a bizarre, desperate experiment to study and transmit their findings back to earth. I love writing utensils, and my favorite brand is Paper Mate. A year or so ago, one of my kids bought me a Parker ink pen for Christmas. No worries: Parker and Paper Mate are both owned by the same parent company, Sanford. 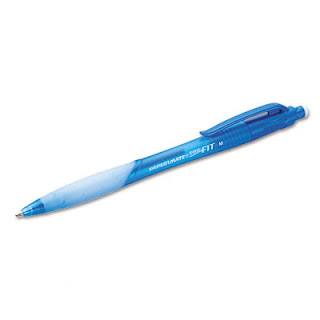 As for my current favorite type of Paper Mate, that would be the Pro-Fit. It is absolutely wonderful. Nice grip with bright, bold ink.